Lately, I’ve taken to leaning against trees. Not just any trees – but old gnarly trees. Trees that look like they’ve been there forever. I lean against these trees to get my spine as close as possible to the trunk of the trees – to get the energy of the tree, the spirits in the tree, into my chakras. I’ve finally gone totally woo woo, right? I would like to clarify – I’m not a tree hugger, I’m a tree leaner. I look at some of these trees and I just know there are spirits within. Spirits with wisdom, spirits that can heal, spirits that can speak to me, if I listen. It’s something many indigenous peoples believe. They believe there are spirits in the rocks, and mountains and rivers and seas, too. That the earth is alive with spirits. So most days I walk. 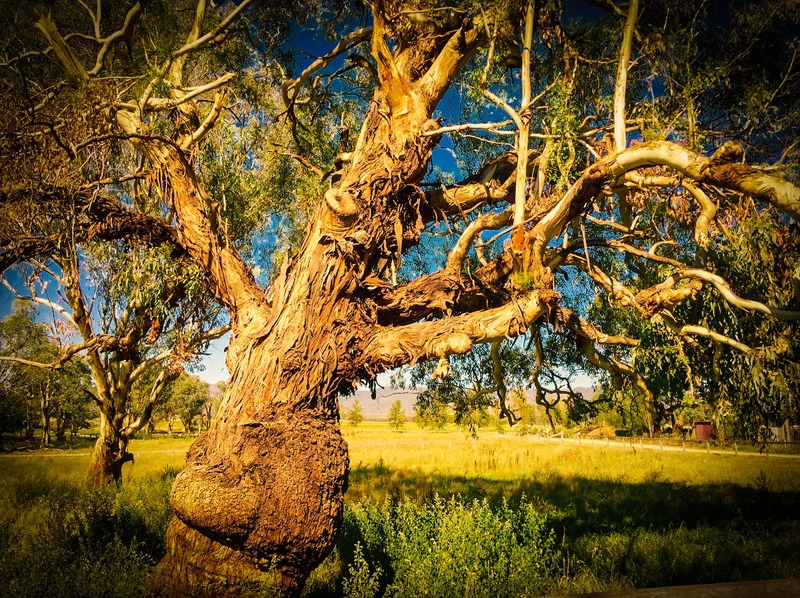 And where I live, in Mudgee, it’s a three minute walk to a magnificent park by a river – the park is full of old wise trees – and then it’s a ten minute walk before I’m out in amongst the vineyards, and the bush, where there are some glorious stands of very old white River Gums. Often I see kangaroos, always I see flocks of beautiful native cockatoos and other birdlife. It fills me up, each time I go out for a walk. Most days I walk at least 10kms, some days 15kms, and on Sunday’s 20kms. This kind of mileage takes time, and so being a person who doesn’t like to waste time, I listen to audiobooks. In this way I’ve “read” many of the classics – Dickens, Wilkie Collins, Herman Melville, the Bronte sisters, and so on – as well as Graham Greene, Hemingway, John le Carre, Ray Bradbury – and most of the Booker prize winners. I read the Game of Thrones series though in book form. George RR Martin’s writing can’t be fully appreciated in audio form. His use of language is so delicious to read off the page, and the storytelling is too complex. Same with JK Rowling and the Harry Potter series. What has this got to do with me leaning against trees? Books carry a vibrational energy – from the energetic Creative Will of the author, which, if written in truth, comes from the Creative Source. A book really sings to you when that energy is in harmony with your own energy at that time. A while ago I shifted from fiction to non fiction – both in what I read read, and what I listened-to read. In particular I’ve been doing a big catch-up on esoteric literature. There is so much for me to learn. It’s a whole new field of study. But now and then I still like to read a good work of fiction. I was about to go out on a walk the other day and I had to choose a new book to listen to. I’d just finished The Heart of the Soul, by Gary Zukav, and I wanted a break from this kind of stuff. I decided I would start the second book in a recent Stephen King crime series – the book was called Finders Keepers. A lot of people deride Stephen King. They’re snobs. He’s a great storyteller, and a great writer. And I’ve read most of his books. But as I got into Finders Keepers I found myself getting more and more agitated. It just didn’t sit right with me, even though I’d enjoyed the first of the series, Mr. Mercedes. It’s terrific crime fiction. I realised that my agitation came from the fact that the book, whilst well written and a gripping story, was vibrating at a low energy point. And I was needing something of a higher vibration. I wanted fiction though, and so on a whim I chose John Steinbeck’s To a God Unknown. Steinbeck is a Nobel Prize winner. He’s best known for Of Mice and Men, Cannery Row, East of Eden and The Grapes of Wrath. I’d read most of Steinbeck in my early 20s, and he became a huge influence on my own writing. Journal of a Novel, his daily account of his writing of East of Eden, tells you more about the writing process than any college Creative Writing course. I’d read To a God Unknown more than 30 years ago, and remembered that it had a big impact on me at the time, but I’d forgotten it. And now the book called to me. It was asking me to read it again. I couldn’t understand why, but I’ve learned now to listen to that voice, and so yesterday I started to read the book again, on Audiobook, as I walked out into the bush. It’s set in the early 1900s, and it’s about a young man who settles in the Salinas Valley in Northern California – and he comes to believe that the spirit of his father, who has recently passed, has come to inhabit a huge oak tree near his house. So I’m reading this book – or listening to it – and the synchronicity of it hits me hard. At this point in my life where I am seriously beginning to embrace the notion of spirits in trees, this book comes along, written by one of literature’s great minds, and in a sense Steinbeck validates what I’m thinking about. haha – Ingrid, you are always the first person to like my posts! Thank you! Lynda – you normally fight it out with Ingrid, and Britta too, to be first too!! I’ve gotten a bit slower the last two years! OMG do you all realize we have been blog friends over THREE years now? I love that you are sharing your life with all of us!!! On another note – you have COCKATOOS? The pictures Janet, Brita and Jenny send are always showing such beauty in Australia. You have palm trees, kangaroos, koalas and now cockatoos. Boy England made a mistake sending all the prisoners there. They should have switched places. I think I’m going to have to switch to audio books. I think I can listen faster than I can read. My list of “to read” is getting long. PS What type of device do you listen to books on? Phone. I pod? ? Mate, you never cease to amaze me. Thanks for the call and enjoy your walk. Thanks also for your love. Good talking to you Steve. And to Marilyn too. Glad to hear you’re feeling better, that you’re back home, and all is good. I worry about you sometimes mate! !